The 2004 Atlantic hurricane season officially began on June 1, 2004. It lasted until November 30. These dates usually mark the beginning an the end of the period of each year when most tropical cyclones form in the Atlantic basin. However, the 2004 season went past these actual limits slightly. For example, Tropical Storm Otto formed on the last day of the season and lasted two days into December. The season was above average in activity. It had fifteen named storms and one of the highest Accumulated Cyclone Energy totals ever recorded. The most season included storms called: Hurricane Charley, Frances, Ivan, and Jeanne. Hurricane Alex formed on July 31 off the coast of South Carolina. Alex quickly strengthened into a category 2. On August 3, Hurricane Alex came within 10 miles of North Carolina. Hurricane Alex turned northeast and dissipated in the middle of the Atlantic Ocean. Because Hurricane Alex did not make landfall it only caused $2.4 million in damage and only 1 person was killed as a result of the hurricane. For the official forecasts, see the NHC's archive on Hurricane Alex. the NHC's archive on Tropical Storm Bonnie. the HPC's advisory archive on Bonnie after landfall. Hurricane Charley was a strong hurricane that strengthened very fast. Charley also made landfall further south then he was supposed to. Charley left $16.5 billion in damage and 35 deaths. The damage caused by Charley made it the second costliest storm in U.S. history, only to Hurricane Andrew. This beaten by four other storms within 4 years, it was beaten by Hurricane Katrina, Hurricane Wilma, then Hurricane Ike. That makes Charley the fifth costliest storm in U.S. history. For the official forecasts, see the NHC's archive on Hurricane Charley. Danielle was a category 2 hurricane of 2004. It started on August 13 in the far east Atlantic Ocean. The path took it over cooler waters, which caused Danielle to die on August 21. For the official forecasts, see the NHC's archive on Hurricane Danielle. On August 13 Tropical Depression Five formed. On August 14 it became Tropical Storm Earl. Tropical Storm Earl passed south of Grenada and became a tropical wave. It was no longer a tropical storm. Later on the remains became Hurricane Frank in the Pacific Ocean. See also 2004 Pacific hurricane season for information on Earl after it crossed oceans. Frances was one of the four hurricanes to have a major impact of the U.S. state of Florida. Frances made landfall near the same location Hurricane Jeanne would make landfall in about two weeks later. Frances caused about 101 tornadoes from Florida to Virginia. Frances killed 49 people and $12 billion in damage. the NHC's archive for Hurricane Frances. the HPC's advisory archive on Frances after landfall. Gaston started as Tropical Depression Seven on August 27. It strengthened into a tropical storm. Later on it strengthened into a hurricane very shortly before landfall in South Carolina on August 29. On August 30 it moved back into the Atlantic Ocean. Gaston died on September 1, after killing 9 people and causing $120 million in damage. Hermine started about 360 miles south of Bermuda. It moved west and became a tropical storm. Hermine moved quickly north and on August 31 made landfall in New Bedford, Massachusetts as a weak tropical storm. Hermine died on the same day after killing no one and causing little damage. Hurricane Ivan was the strongest hurricane of the 2004 Atlantic hurricane season. The storm formed as a Cape Verde-type hurricane in early September, and became the ninth named storm, the sixth hurricane, and the fourth major hurricane of the year. Ivan reached Category 5 strength on the Saffir-Simpson Hurricane Scale, the highest possible category and the only one of the season. At the time it was sixth most intense Atlantic hurricane on record. the NHC's public advisory archive on Hurricane Ivan. the HPC's advisory archive on Ivan after landfall. 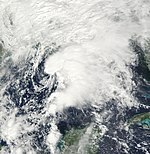 Tropical Depression Ten was the only depression of the 2004 Atlantic hurricane season. 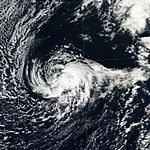 Ten formed in the northeast Atlantic on September 7 and dissipated two days later, Tropical Depression Ten caused no affects to land. Hurricane Jeanne was a deadly storm, especially to Haiti. The storm cause 3,035 deaths, about 3,006 were in Haiti alone. Hurricane Jeanne was also a costly hurricane. With $7 billion in damage makes it the 13th costliest hurricane in U.S. History. In Florida the hurricane made landfall in the same area as Hurricane Frances only two weeks before. 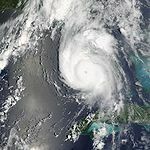 the NHC's public advisory archive on Hurricane Jeanne. 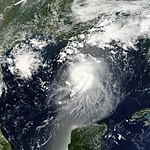 the HPC's advisory archive on Jeanne after landfall. Hurricane Karl was a strong category 4 that only affected the Faroe Islands. 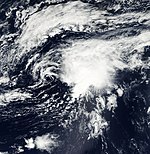 Karl formed in the middle of the Atlantic on September 16 as Tropical Depression Twelve. It became a tropical storm that same day. Two days later it became a hurricane and by September 21 it became a category 4 and soon reached it highest winds of 145 mph. It continued north weakening and then becoming extratropical on September 24. For official forecasts see the NHC's public advisory archive on Hurricane Karl. Lisa was a category 1 hurricane, it remained weak for much of its early life. After almost 14 days it finally became a hurricane. 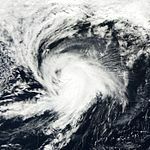 Hurricane Lisa started on September 19 and died on October 3. For official forecasts see the NHC's public advisory archive on Hurricane Lisa. the NHC's public advisory archive on Tropical Storm Matthew. the HPC's advisory archive on Matthew after landfall. Subtropical Storm Nicole was the only subtropical storm in 2004. Nicole formed on October 10 southwest of Bermuda. Subtropical Storm Nicole dissipated the next day. Nicole caused swells to the East Coast of The United States and almost 6 inches of rain in Bermuda. For official forecasts, see the NHC's public advisory archive on Subtropical Storm Nicole. Tropical Storm Otto form late in the season of November 29 and on the same day, Tropical Storm Otto reached it's highest winds of 50 mph. Otto then dissipated on December 3. For official forecasts, see the NHC's public advisory archive on Tropical Storm Otto. The list is the names that were set aside for the 2004 Atlantic hurricane season. Name that were not used are marked in gray. In the spring of 2005 four names were retired. They are Charley, Frances, Jeanne and Ivan. In 2010 they were replaced with Colin, Fiona, Igor, Julia. ↑ "2004 Atlantic Hurricane Season". National Weather Service. Retrieved 2009-09-05. ↑ National Hurricane Center (2004). "Tropical Cyclone Report: Hurricane Alex". NOAA. Retrieved 2006-03-18. ↑ James L. Franklin, Daniel P. Brown and Colin McAdie (2004). "Hurricane Gaston Tropical Cyclone Report" (PDF). National Hurricane Center. Retrieved 2008-04-15. ↑ National Hurricane Center (2004). "Tropical Cyclone Report: Tropical Storm Hermine". NOAA. Retrieved 2008-08-12. ↑ National Hurricane Center (2004). "Tropical Cyclone Report: Hurricane Karl". NOAA. Retrieved 2006-03-18. ↑ National Hurricane Center (2004). "Tropical Cyclone Report: Tropical Storm Otto". NOAA. Retrieved 2006-03-18. 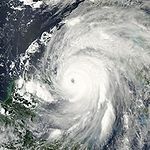 Wikimedia Commons has media related to 2005 Atlantic hurricane season.